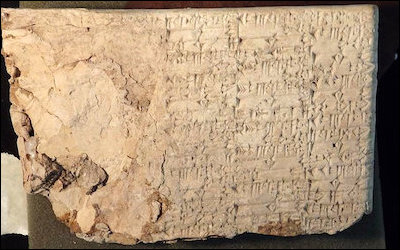 One of the clay cuneiform tablets illegally imported into the United States from Iraq by the owners of Hobby Lobby. Collecting antiquities is morally and legally problematic. The recent civil complaint the Justice Department filed against the Green family, the owners of Hobby Lobby, demonstrates just how problematic it is. Long accused of illegally importing Iraqi antiquities into the United States to increase their already massive collection, the Greens have now agreed to forfeit thousands of objects, mostly cuneiform tablets, and to pay a $3 million fine. The case brings American cultural heritage policy—how the U.S. government understands, supports, and defends cultural heritage, including antiquities sites and cultural property—into the spotlight once again. It also highlights the fact that cultural heritage policy is far more than a matter for law enforcement. Indeed, cultural heritage policy is tied to both foreign and security policy. Intelligent foreign policy demands deep understanding of how culture shapes conflict, including those cultural artifacts that can be removed from their places of origin. Meanwhile, both terror groups and transnational criminal syndicates often loot and smuggle antiquities to finance their operations. Non-state actors operate globally, thriving in corrupt, weak or collapsed states, where such activities are relatively easy. The cultural costs are the destruction of archaeological and heritage sites, the weakening of local economies, communities, and nations, and the erasure of humanity's common narrative. The U.S. government has responded to ISIS looting with stricter customs monitoring and criminal prosecutions. The U.S. government has responded to ISIS's looting across the Middle East and North Africa with legislative and executive moves to restrict the import of stolen antiquities and other cultural property, stricter monitoring by customs and law enforcement, criminal prosecutions, programs to document looting and destruction, and the training of local cultural heritage specialists. One new approach is to use the civil forfeiture provisions of the Patriot Act to seize looted artifacts when they come to market. But more can be done, including placing antiquities dealers and buyers with documented terror connections on U.S. Treasury and travel watch lists, seizing their assets, and sanctioning banks, auction houses, and other firms involved in illicit trade. New government requirements to include cultural property in the financial industry's anti-money laundering training would also be useful. The U.S. government should also, along with NGOs and academic organizations, raise public awareness about the damage done by the sale of antiquities: One television spot with Kim Kardashian could put looted antiquities into the same category as baby seals. One television spot with Kim Kardashian could put looted antiquities into the same category as baby seals. For its part, the U.S. military has focused on immediate issues, namely antiquities looting in the context of countering terror financing, and the perennial problem of protecting heritage sites from harm during operations. But the problem of cultural heritage will become acute for both military and civilian authorities when stability operations in places like Afghanistan and Syria turn into post-conflict reconstruction. Here the U.S. government (and the international community) will be confronted by a series of problems, such as irreconcilable claims regarding the possession of cultural heritage sites and property from different ethnic, religious, and local groups. To whom do sites belong? What should be rebuilt and by whom? Will, for example, Shi'a and Yazidi shrines and mosques destroyed by ISIS in northern Iraq and Syria be rebuilt? Who has responsibility for restoring ravaged antiquities sites in northern Iraq, like Nimrud—the Kurdish or Baghdad government? Cultural heritage problems will do much to shape post-conflict politics and landscapes. Local consensus will be difficult, and the international NGO and development communities will inevitably weigh in. The process is likely to cause further conflict, opening the way to more looting and destruction. Furthermore, the immense piles of money that are a part of post-conflict reconstruction will encourage looting. These will be policy issues for the United States, whether we like it or not. Figures are already being floated for Syrian reconstruction, but who profits and at what cultural costs? The fate of Beirut after the Lebanese Civil War is instructive. Beirut's core was reconstructed largely by Prime Minister Rafik Hariri's company, which expropriated huge tracts, displaced thousands, demolished traditional architecture and antiquities sites over local protests, and created glitzy residential, shopping, and business districts. Some archaeological research was undertaken but overall the international community complained little. Cultural policy is about values, both those we share and those that we alone prize. The reconstruction of Syria will receive international money, perhaps even including American dollars. Paving over Syria's cultural heritage should not be an option, nor should paying the perpetrators of mass murder to do so. As the Assad government crushes its opponents, with Russian and Iranian help, should the U.S. government help with reconstruction? Should cultural specialists inside (and outside) the government even participate? The same questions will arise in Libya, Yemen, and other places. A task force should be convened now to recommend policy options going forward. Cultural policy is about our relationship with other countries and their pasts, which help shape their futures. But it is also about values, those we share and those that we, and perhaps we alone, prize.